The F6 corridor route has been announced by the NSW state government & currently there is detailed testing being conducted along the corridor to determine underground rock and soil conditions for the tunnel. The route if built would eventually connect up to the M5 section of WestConnex at Arncliffe in the north & the M1 Princess Highway at Waterfall in the south. The project is being dubbed to be called SouthConnex. It is expected the new motorway would bypass 42 sets of traffic lights between Tom Ugly’s Bridge in Sylvania and St Peters & 18 sets of traffic lights between Tom Ugly’s Bridge in Sylvania and Loftus. This will make commuting from any suburb south of Waterfall much easier for those who work in Sydney & is a missing link in Sydney’s Motorway Network. 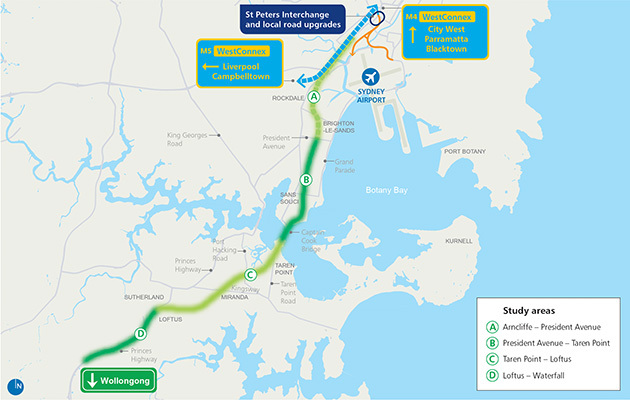 An announcement on the project is not expected to be made in the near future as it is dependent on several other motorway projects, such as Westconnex being completed first. It will also have to go up against all other infrastructure projects for funding including Light Rail projects, Sydney Metro projects & Other motorway projects such as the Northern Beaches Link as there are limited funds. The future for the project does look promising for the F6 Freeway and with the state government’s commitment to do geo testing in the corridor, only strengthens this viewpoint. The public transport option for the route has been ignored according to an article posted by the Sydney morning herald. According to 7 News, The Roads minister Duncan Gay revealed that the geotechnical work results for the SouthConnex project came back & found that there is a lot of sand along the route where the tunnel would go. This material is undesirable for tunnel construction meaning the route may have to be changed & could involve the compulsory acquisition of properties along the new route if the project goes ahead. According to SMH, it is expected that the F6 Extension will cost $16 Billion & tolls for motorists entering at St Peters & exiting at Waterfall will be paying $10 each way. This means motorists will have to pay $100 per week & this does not include the cost of getting into the city via the new M5 Westconnex extension which could add another $6-7 each way to the trip in 2024. This article has reminded me of strongly opposed I am to the proposed F6 Freeway extension. There seems to be a lack of organised groups or petitions against the idea, so I’ve started a facebook page called “No F6 Freeway”. Please like and follow if you, too, can’t see the benefit in another freeway attracting more cars to this route – or you’re interested in learning more about why we think there will be no benefit. As with any major infrastructure project there will always be opposition. Do you believe a high speed rail line to Wollongong from Central via Sutherland would be a much better spend of funds? Yes, definitely. (Sorry I didn’t get a notification of your reply). I am from the area and the road system is generally well resourced and well functioning, what we need is faster and more frequent public transport. The area is a good example of the Downs-Thomson paradox in my opinion. If the train from Waterfall to Central took 30 minutes, many less people would want to spend an hour driving. (Currently that train takes at least 45 minutes, plus time from the stations to doors). The roads would then be free for the people who do have to drive (of course there will always be some). Your post dated 9-May-2017 is out of date already. Two events have occurred since then which, in my eyes, mean the cost and ROI on the F6 simply isn’t justified. 2. The public transport option has been ignored and really needs to be considered. Hey Nigel, thanks for your efforts in compiling the data. We have updated the article & credited you. It looks like the further time goes on, the more unlikely this project is becoming & the worse it will be for residents along the route. I see what you did there, nice one! Can you also see that the rta, now rms, had been delivering studies for 50 years saying the f6 is unfeasable. I live at Engadine and have done so for the past 25 years. This road is so needed. Why is it the south gets no infrastructure? Ii takes me forever to get out of my suburb and the constant flow of trucks is annoying. Take a slice of the national park, the dam thing is full every weekend anyhow and the slice they want to take isn’t visited anyhow. Fix the rail system too. How about a train station at Yarrawarrah or do the locals have to pay for half of that as well like they did for Engadine train station. Yeah, Engadine, always overlooked and dumped on, like the government allowing woronorra Heights traffic to back flow through Engadine because they don’t want the fire trail opened up, totally selfish. The current highway south is a joke, equivalent to a goat track with all its traffic lights, build a decent 6 lane one south for future growth and return the suburbs that have suffered infrastructure neglect for the past 30 years back to the locals. They should not cut through the National Park. Build a tunnel by all means. That piece of national park is used all the time by walkers and bicycle riders. A freeway would also cutoff access to several access points. Hands off National Park. It was just announced that the f6 in current form would have the highest toll of any toll road in Australia. 50% of which would go to a private operator. The private operator having bought their 50% stake for less than8% of construction costs. Sounds like corruption to me.